Franciszek Krysinski, 95, of New Britain, beloved husband for 66 years of the late Stanislawa (Bielinski) Krysinski, passed away on Thursday, Nov. 1, 2018, at the Hospital of Central Connecticut. Born in Kossaki, Poland on Oct. 18, 1923, son of the late Jan and Boleslawa (Wrobel) Krysinski, he was raised in Poland and immigrated to the United States in 1966. After living in Hartford for almost 40 years, Franciszek moved to New Britain in 2009. While living in Poland, Franciszek worked as a farmer and after moving to the United States he worked as a machinist retiring from Jacobs Manufacturing in 1985. A devout Catholic his entire life, Franciszek was a parishioner for SS. Cyril & Methodius Church in Hartford where he was also a member of the Holy Rosary Society, the SS. Cyril & Methodius Church Choir, and the Golden Senior Fellowship. 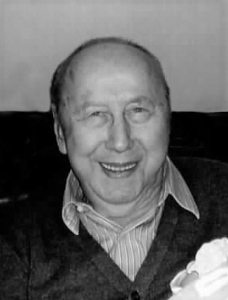 Proud of his Polish heritage, Franciszek gave back to the Polish community through his work with the St. Albert Society which helped Polish families in the Polish area with jobs and other challenges they faced while acclimating to life in the US. In his spare time, he enjoyed gardening around his home and making wine with his wife. Most of all, he will be remembered as a loving husband, father and grandfather. He leaves two sons, Joseph Krysinski and his wife, Anna, of South Windsor, and Gerard Krysinski and his wife, Danuta, of New Britain; a daughter, Regina Albera and her husband, Martin, of Wethersfield; a son-in-law, Galo Velez of Worcester, Mass. ; five grandchildren, Joseph Krysinski and his wife, Audra, of Castle Rock, Colo., Mark Krysinski and his wife, Gosia, of Newington, Lisa Velez and her husband, Jai, of Worcester, Mass., Christopher Krysinski of Norwalk, and Janina Gonzalez and her husband, Pablo, of Worcester, Mass. ; six great-grandchildren, Jaisean Arianna, Jailen Harris, Ryan Gonzalez, and Ava and River Krysinski; and many other family members and friends in the United States and Poland. Besides his wife, he was predeceased by a daughter, Helen Velez; three brothers; and three sisters. His family will receive friends on Monday, Nov. 5, 8:30 to 9:30 a.m., at the Waszkelewicz South Green Memorial Home, 43 Wethersfield Ave., Hartford, followed by a Mass of Christian Burial, 10 a.m., at SS. Cyril & Methodius Church, Hartford. Burial will follow in Sacred Heart Cemetery, New Britain. The family has requested that memorial donations be made to SS. Cyril and Methodius Church, 55 Charter Oak Ave., Hartford, CT 06106. For online condolences visit, www.carmonfuneralhome.com . Posted in New Britain Herald, on Friday, 2 November 2018 21:03. Updated: Friday, 2 November 2018 21:05.